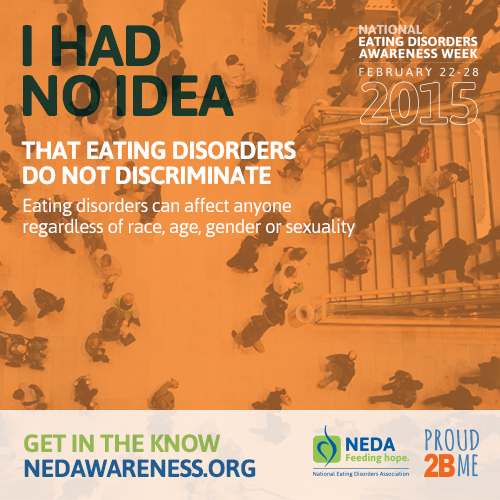 February 22nd-28th is National Eating Disorder Awareness Week 2015. This year’s theme, “I had no idea,” sounded so familiar – especially as more and more local and national conversations about sexual assault arise. Much like sexual violence and survivors of sexual violence, there are a lot of misconceptions about eating disorders and people who experience them. Follow the National Eating Disorder Association (NEDA) on Twitter. Like them on Facebook. Add them on Tumblr. SHARE posted resources with the folks in your social networks. Learn more about emerging research connecting sexual trauma and eating disorder behaviors – there are a number of resources to help practitioners find ways to strengthen practice. Push back against media portrayals and images. Critical media literacy can play an important role in shifting norms that allow sexual violence and dangerous appearance expectations. Let’s equip ourselves with the skills and tools to think more critically about what we see.